Loyalty Cards. A Good Deal Or A Scary Big Brother? Remember when you used to be able to walk into a store because they were having a sale on (insert favorite product here), paid the cashier and were on your way? Not anymore. 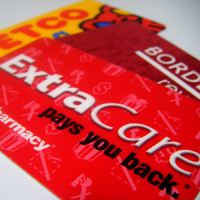 Most stores, particularly the grocery or pharmacies, require you to present a “loyalty card” to receive sale prices or discounts. And truth be told, when you don’t have one, you are missing out on big savings! The main argument against registering for loyalty cards is privacy. People don’t want to give out their personal information and have their purchases and buying behaviors tracked. I get that in a way, but I also need to watch my family budget. I figure if Rite-Aid knows that I bought toothpaste at 12:49pm last Tuesday and subsequently wants send me a coupon for my next purchase, fine by me. In addition to discounts, many stores also offer cash back on your purchases. It’s usually something like 2%, but over the course of a season, that can add up! Many pharmacies also offer deep discounts on prescriptions and some even help you contribute to your children’s 529 Plan. You have to register using your name, address and phone number (alias and fake info, anyone?). In my personal opinion, anyone asking for more than that (i.e. credit card numbers, social security or driver’s license numbers) is a no-go in my book. I personally have a few loyalty cards, and although I tend to sigh loudly when I need to spend way more time than I should holding up the line to excavate it from my wallet, it’s typically worth the savings. Happy shopping! Previous Post“Do Kids Belong In Restaurants?” Article In The Herald. Our 2¢ On The Subject. Next PostThe Right Way And The Wrong Way To Use Consumer Loyalty Cards.